When I asked the family about Saradhaji’s specialty dishes, they reeled off a list of traditional TAMILIAN recipes in one breath. As her daughter says, “Most of her culinary skills were downloaded from my paternal grandma. They were a great team in the kitchen and outside.” As I interviewed her, I also had the pleasure of enjoying a savory snack ‘Thavaladai’ and a sweet dish ‘Paal Kozhukattai’ – delicious with an authentic flavour! 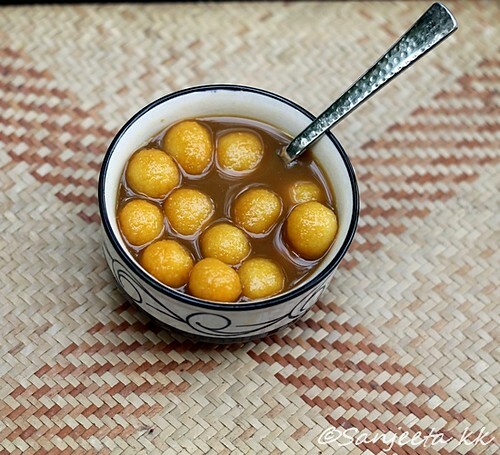 Paal Kozhukattai is a popular offering on festivals such as Piliyar Chaturthi and Aadi Vellikilamai. 1. Wash the rice, strain and spread it on a thick cloth. Allow it to dry and when it is just a bit damp, grind it to a fine powder. Set aside. 2. Add 1 cup water in a thick-bottomed pan. Switch on the flame, and when the water has parboiled, add 1 tablespoon milk. This helps to avoid formation of lumps. Turn the flame to medium heat and immediately add the rice powder and ghee. Stir continuously to avoid lumps. Cook for 8-10 minutes until it becomes a thick dough and leaves the side of the pan. Now switch off the flame and place the dough in a bowl. Cover with a damp cloth for 15 minutes. 3. Next, knead the dough with your palms and a dot of ghee. As the dough becomes soft, roll into marble-sized balls and set aside. If the dough has been cooked well, it will not stick to your palms. 4. In another pan, heat the jaggery in 2 cups water. When it comes to a boil, switch off the flame. Strain and place on medium flame once again. Add the marbles and stir gently. Cook for 8-10 minutes. Now add the remaining milk and bring to a boil. Add the cardamom powder and camphor and switch off the flame. The dish will have a saucy consistency. Enjoy Paal Kozhukattai warm or chilled. You can garnish with fried cashews if you wish. Many families prefer to use coconut milk in this recipe. This recipe was first published in The Great Granny Diaries – a column in Harmony Magazine. Part-1 of this post is the interview with Saradha Rajamani, a great-granny from Salem.